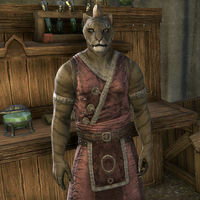 Mazil-jo is a Khajiit mystic who can be found at his shop, The Eldritch Seal in Skywatch. He advertises his wares when you speak to him: "Diamonds? Rubies? Ziss on them! Nothing but polished rocks. My soul gems are the only stones you'll ever need."